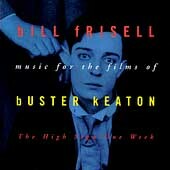 The second album in Frisell's Buster Keaton series, The High Sign/One Week has two soundtracks for two Buster Keaton shorts. While they don't quite have the same sensitive mournful quality I find so moving in Go West, the album is full of wonderfully Frisell-ian surprises. Like Go West, each film is given a few short themes which are run through a variety of interpretations. This album is a little bit more out than Go West, with plenty of forrays into more abstract playing. It also has a bit more of a rock edge to it, with Frisell's wailing Hendrix like tone coming out on a few tracks. The album is only thirty five minutes however, and while it is quite good, that does create another factor in the purchase. But the album does have the stunning Frisell/Baron/Driscoll interplay that makes Go West so wonderful, which makes it worth getting in my book.